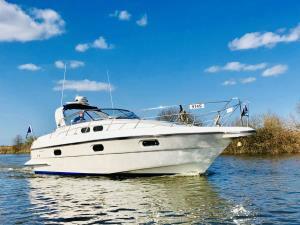 Broadland Charters07515 904946work Boat HireWhy choose a self drive day boat when you can step onboard a luxury sports boat with a fully qualified skipper and have crew to look after you for the duration? Without a doubt, the very best way to discover the Norfolk Broads is by boat - we are unashamedly biased but there really are so many stunning places which are only accessible by river and our luxury sports cruiser is the most stylish way to cruise. Perfect for celebrating a special occasion, hen party, baby shower or even a romantic proposal. "Norfolk Time" is a local saying that describes the slow and relaxed pace of life experienced throughout Norfolk and the Broads so we thought it rather an apt name for our charter boat. Our friendly and fully qualified crew will warmly welcome you onboard our sports cruiser "Norfolk Time" where you get the opportunity to relax and enjoy the more laid back atmosphere. Choose from a range of our special extras and make your Broadland Charters experience extra special. Whilst we provide unlimited Norfolk tea, coffee and water with every cruise why not check out our onboard refreshments and dining menus before you book and pre-order a bottle of wine, jug of Pimms or really push the boat out and celebrate with champagne. If you're feeling peckish choose from a selection of locally prepared food including picnics, afternoon tea, handmade chocolates, cheese board or canapes and sample them whilst watching the ever changing scenery? We can also arrange for the boat to be tastefully decorated for the occasion, bouquets of flowers to be delivered and fun packs to keep the children occupied. So let's chat through your ideas and specific requirements to create the perfect day out for you. Our dedicated and passionate crew will warmly welcome you onboard and deliver the very best private charter boat experience on the Norfolk Broads. Cruise the Norfolk Broads in style onboard our luxury, skippered sports cruiser "Norfolk Time". Why choose a self drive day boat when you can step onboard a luxury sports boat with a fully qualified skipper and have crew to look after you for the duration? Without a doubt, the very best way to discover the Norfolk Broads is by boat - we are unashamedly biased but there really are so many stunning places which are only accessible by river and our luxury sports cruiser is the most stylish way to cruise. Perfect for celebrating a special occasion, hen party, baby shower or even a romantic proposal. Simply choose the number of hours you want to cruise and we'll supply the scenery and unlimited refreshments (tea, coffee and water) for the duration. Minimum 2 hours.